WAN optimisation and VPN acceleration delivered through a variety of software/virtual environments, integrated into your firewall device. These software deployments/licenses eliminate performance bottlenecks from application and VPN connections by only transmitting new or changed data and compressing traffic between sites. 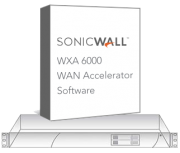 Application traffic is prioritised and minimised when deployed in conjunction with SonicWall firewalls. WXA can be deployed on VMWare or software platforms on a variety of hardware platforms. Comparative features and statistics of the WAN Acceleration. Click the to remove a unit and select from the list on the right to add another.